Whenever we had to fasten a component to an apparatus he said, “Why don’t you use a hose clamp?” With every hose clamp that we added to the experiment, my hatred for them grew larger, and I started to develop the philosophy of the “beautiful instrument.” Back then, any hose clamp-free instrument qualified as one, but I have refined my threshold since. The biggest kudos I could give students working for my boss and me was, “This is what I call a beautiful instrument.” In my ideal world, all researchers would aim to build an instrument (or experiment or apparatus) with aesthetic appeal. All other things being equal, if you had the choice between working with a good-looking instrument or an ugly one, which would you choose? Of course you would choose the beautiful instrument because it is a joy to be surrounded by lovely things. Following this logic, no ugly experiment should exist in the world, and we can close the case. Wait, not so fast! As a matter of fact, there are ugly instruments (although maybe not at NIST). So, we need to discuss how ugly instruments come into being. 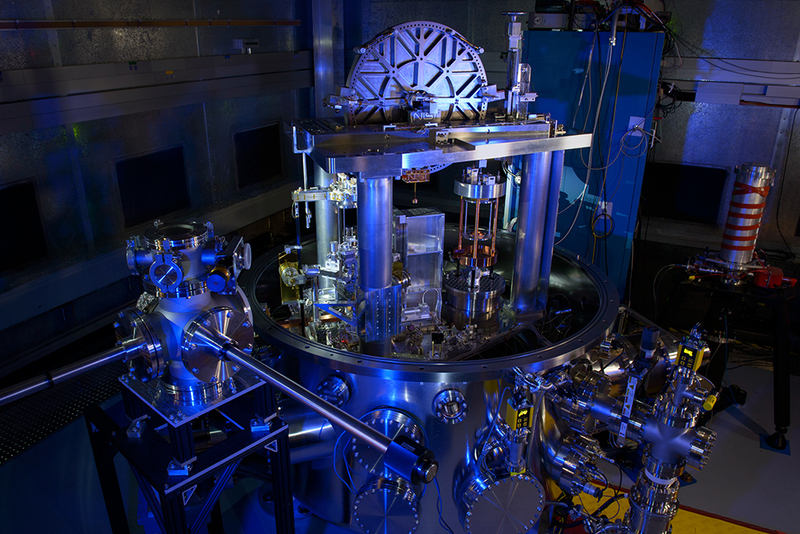 Even without the dramatic lighting, the NIST-4 Kibble balance that our team used to help redefine the kilogram is what I call a beautiful instrument! No instrument is designed to be ugly. All instruments are trying to measure a fundamental property of our universe, or an object/material therein, and as such are conceived as an elegant idea. A design is made to tackle the measurement problem, and a first iteration of the instrument is built. So far everything looks good, but ugliness soon starts to creep in. You put the first iteration to the test, and as is always the case with first iterations, things don’t work as intended. Bolt patterns don’t match up. Clearances become interferences, and it becomes apparent that you did not even think about cable management. But you have the first prototype in your hand, fresh from the machine shop, and you are eager to make a measurement. So, by hook or by crook, you make it work. You break out the duct tape, the zip ties, the hose clamps, the hacksaw, the file, and the cordless drill to modify the instrument to get the job done. Ten years later the instrument still works and is still in your lab with the duct tape, zip ties, and hose clamps that you put on during the first week of the experiment. This is the way ugly instruments are born and continue to exist for a long time. Yes, you got your mission accomplished, but you also deprived yourself of nine joyful years because you had to be around that zip-tie and hose clamp-laden monstrosity. What if I told you that, in the scenario discussed above, there was a way to accomplish the mission, with maybe a slight delay, and also have a lot more joy, satisfaction, and fun working because you are interacting with a thing of beauty? Even better, it will outperform the ugly one because it is easier to spot if something is misaligned. Have you ever noticed how easily you notice an exquisite thing’s smallest fault? If your experiment is out of alignment, it is much easier to see in an attractively organized setup than in a morass of temporary kludges. So, in the long run, a beautiful instrument may even save you time because you don’t waste days taking data with a misaligned instrument only to find this out after the fact. I am not advocating forgoing success with the first prototype that you get going with zip ties, hose clamps, and duct tape. I think this is an important phase in the scientific endeavor. You should be proud of your achievement: You made the first measurement, and you have a proof of principle of the apparatus. But then, pause. Look at your instrument and design iteration two. Improve all the flaws that you have identified and spend some time to make the instrument beautiful. The instrument is going to be around for a long time, so the little extra time and cost that you spend at the beginning is not significant, especially if the lovely iteration outperforms the patched-up one. The more obvious benefit of an alluring instrument is that it makes for an eye-catching photo that can give you exposure. Although you may be able to impress the subject matter expert with a picture of an ugly experiment because she can peel the onion of ugliness and get to the measurement principle, you will not score points with the public. They will say, “Yeah, looks like science.” But this pales in comparison to the statement you could get from a picture of your gorgeous instrument: “Wow, science is so breathtaking!” Believe me, you want the latter. Close-up of the Kibble balance's inner workings. Note the graceful cable management! Experiments become ugly in the tense space between obtaining a fast solution and doing the right thing, the beautiful solution. Once a fast solution is found, the pressing need to tend to the problem evaporates, and the beautiful solution is never revisited. Hence, if a quick solution was chosen, it often stays in place for a long time. In the decision-making process, ugliness is not the antagonist of beauty. Instead, the real enemy of beauty is expediency. Nobody likes to choose an ugly solution. But people like to choose the expedient solution. The phrase “quick and dirty” captures the strategy precisely. The crux is, how does one weigh disparate categories like beauty and convenience against each other? Clearly, the parameter range in each category is more than black and white. There are as infinitely many shades of grey between ugly and beautiful as there are between fast and slow. Where do you draw the line if you have to make a decision? It’s difficult to give general guidance on how to decide between an expedient and an elegant solution. I would say, if in doubt, err on the more appealing, but slower, side because in the long run, it is better to live with a fine-looking solution than one that was found quickly. In a few years, no one will remember if the solution was expedient, but everyone will still be impressed by the attractiveness of the instrument. Another way of saying this is: Expedience fades, but beauty remains. While I believe it is best to have more splendor at the cost of simplicity, if you can find a way to have both, by all means go for it. But don’t be deceived by the air of ease, grace, and lightness that surrounds this combination. Any instrument that is so refined is the result of hard work. I believe the attractiveness of objects that are practical and beautiful is a direct consequence of the fact that they let us forget the blood, sweat, and tears it took to conceive and make them. On the other hand, an ugly instrument will always remind us of the struggle required to construct it. In summary, when it comes to building instruments, the gold standard is simple and beautiful. If you have to make a compromise, choose beauty. Now, go and make the world a better place: Build more beautiful instruments. 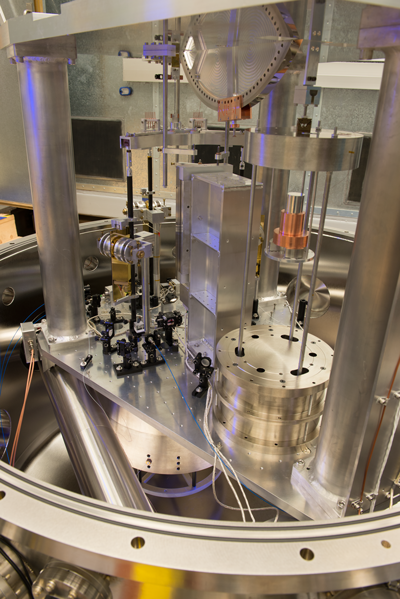 First published March 26, 2019, in NIST’s Taking Measure blog. Dr. Stephan Schlamminger is a physicist in the Quantum Measurement Division at NIST. He has worked on obtaining precise determinations of the Planck constant and the gravitational constant. Currently, his research interest is in the measurement of small masses based on a fixed value of the Planck constant. He is still trying to figure out what the precise value of the gravitational constant is. He likes all coffee-related things, without being a snob about it.